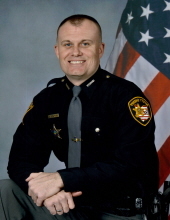 Celebrating the life of William Lee Brewer Jr.
Obituary for William Lee Brewer Jr.
William Lee Brewer Jr., 42, of Pierce Township, passed away in the line of duty on Saturday, February 2, 2019. He was born January 14, 1977 in Cincinnati, son of William Sr. and Angie Brewer. He was married to Jamie Hensley Brewer for 13 years, who survives. Bill was a 20-year veteran with the Clermont County Sheriff’s Office. He’s a 1996 graduate of Williamsburg High School where he was in the sports Hall of Fame. Bill was also an avid UC Bearcat Fan. In addition to his loving wife and parents, he is survived by his beloved son, Braxton Brewer; brother, Michael Brewer; parents-in-law, James and Mary Noll and several nieces and nephews. Family and friends are invited to a public visitation from 4:00 – 8:00 PM, Thursday, February 7, 2019 at Mt. Carmel Christian Church, 4110 Bach Buxton Rd, Batavia, OH 45103 under the direction of E.C. Nurre Funeral Home in Amelia. Funeral services will be held at 11:00 AM, Friday at the Church. Interment will follow at Pierce Township Cemetery. Donations may be sent to "The Bill Brewer Memorial Fund", c/o Park National Bank, 1187 Ohio Pike, Amelia, OH 45102. Right onto Locust Corner Rd. Enter into Cemetery where transfer from the hearse to the horse drawn caisson will take place and horse drawn caisson will proceed to the grave. Flowers need delivered directly to church on Thursday by 12 Noon. No public admittance until 4 PM. Please see obituary for route details. E.C. Nurre Funeral Home and the Clermont County Sheriff's Department ask all PUBLIC wishing to attend the funeral service for Det. Brewer to go to Crossroad's East Side for the live stream provided by Local 12 News. Doors to church will open at 9:00am with services to begin at 11:00 am. Thank you for your cooperation. "Email Address" would like to share the life celebration of William Lee Brewer Jr.. Click on the "link" to go to share a favorite memory or leave a condolence message for the family.